Usually buildings are deemed historic because of their age and architecture. But sometimes historic status derives from what happened in a building. This Real Photo postcard lent us by Mary Chappell shows the West End Settlement, a building that is historic on both counts. 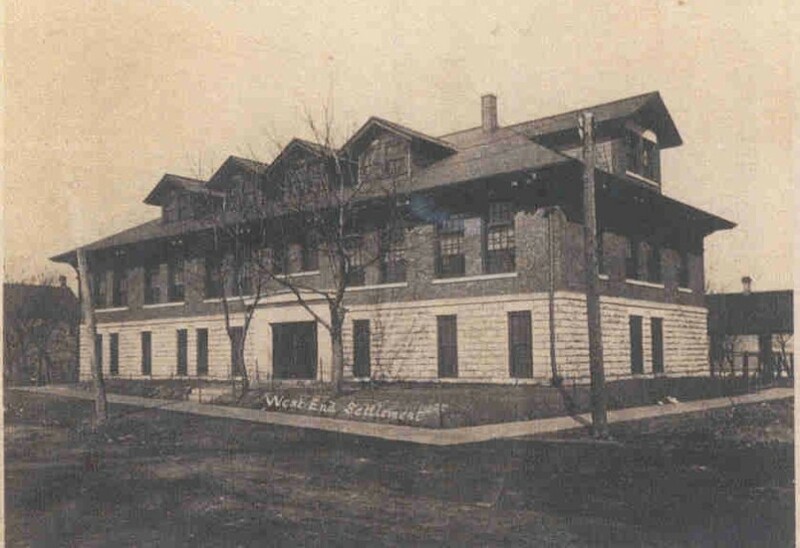 Thanks to local philanthropist Suzanne Denkmann, well-to-do daughter of lumber entrepreneur Frederick Denkmann, Rock Island had the West End Settlement, its own version of Chicago’s Hull House. Miss Denkmann, born in 1872, attended the National Kindergarten College in Chicago and later went to New York where she learned of the work of settlements. In an era before social work was considered a legitimate government function, settlements provided many services to the poorest residents. Upon her return home, she found that local preacher, wife, and mother, Minnie Barker, had already begun some outreach social programs in Rock Island’s West End, which was sometimes called “Goosetown.” At that time, the area had no paved streets or sidewalks, it was filled with dives and saloons, and its unpretentious homes were densely occupied with the poor and uneducated. Mrs. Barker had first started a religious school in a rented building at 7th Street and 7th Avenue. As attendance increased, the school moved across the street to a former saloon, where Mrs. Barker began teaching other skills such as sewing. This caught the interest of Miss Denkmann, who lived nearby in the family home at Second Street and Fourth Avenue. An agreement between the two women was soon reached: Miss Denkmann would build, endow, and pay operating expenses for a real settlement building, unique in the Quad Cities, and she would build a home for the Barker family where they could live forever. In return, Mrs. Barker agreed to manage the settlement without compensation. The new West End Settlement was built on 7th Avenue at 5th Street. It was finished in July 1909, but its work began a year earlier when the lower level was completed. Throughout the years, the building is surprisingly unchanged as we see when we examine the postcard. The photograph could almost have been taken yesterday. Even the original small-paned window sashes are unchanged. It is believed to be the work of local architect George Stauduhar. Plans for a West End Settlement are included in his archives at the University of Illinois. It was called Mission style in early news articles, but we can also see Prairie style influences here as well as Arts and Crafts. These three styles share many similarities as they evolved concurrently in the early 20th Century. The building is strikingly horizontal in emphasis, with heavy stone walls on its first floor. The double width windowsills set into the brick above carry out the horizontal feeling. Simple, but very large, brackets support the wide eaves of the hipped roof. Wide eaves shelter the many gabled dormers as well. Inside, the ground floor had a gym, a kindergarten room, furnace room, and a bathhouse with two tubs, two showers and a dressing room. The second floor had an assembly room that seated 300 as well as two classrooms, a clothing room, office and an apartment for the Barker family. The third floor attic area contained a fully equipped domestic science room, including “glass topped” – probably porcelain — tables, gas burners, a “well-filled fruit closet” as well as a small dining room so clients could learn proper table setting. The building was staffed by six paid workers and many volunteers, often friends of Miss Denkmann. The settlement taught cooking, “physical culture” including basketball, and sewing to girls. Mothers learned sewing as well. Sewing supplies were furnished by the settlement, which also kept the finished garments. In addition to sports, boys could take cooking classes, and were reported superior to the girls in their skills. Men were offered a reading room in the settlement library in a nearby home. A nearby home was used as a day nursery. Surprisingly drunkards were allowed to spend overnight in the building, so their money would not be spent on drink but rather on their families. Religious education and gardening were available to all as was a large playground. John Hauberg, who would soon wed Suzanne Denkmann, was one of the volunteers. He started a fife and drum corps for boys, noting that many joined the program “dirty, ragged, ill smelling and undisciplined.” But they changed. The settlement’s bathing facilities included a towel, warm water, brushes and soap, and cost only 2 cents for those under 17. A closet of affordable clothing sewn in the settlement classes helped address appearances. And the discipline required to be in the corps completed their transformation to “industrious, clean and honest” citizens. An infant welfare station was established at the settlement in 1914. Two years later 65 babies were coming regularly for free milk, weighing, and examination by the Visiting Nurses Association. In 1916 Miss Denkmann, now Mrs. Hauberg, built a separate home for the Barkers just south of the settlement. It was of structural tile covered with stucco in a Prairie style that complemented the settlement architecture and was designed by Architect Cyrus McLane. But only seven years later, Mrs. Hauberg decided that conditions in the West End had improved so much that the West End Settlement was unnecessary. She decided to close the settlement and stop the $9,000 annual support she had been providing. Her decision was challenged by Mrs. Barker, who asked that their house, then worth $100,000, be deeded to her along with $10,000 a year for maintenance. After long court battles, the Barkers won the house as well as cancellation of a $5000 debt. It remained in the family for many years and was recently demolished after being vacant for years. The Haubergs donated the settlement building to the downtown YWCA, who planned to use it as an adjunct to their Third Avenue dormitory, but it appears not to have been used by the Y. In 1931, it was sold to the Belgian American Brotherhood (BAB), who remained there through the early 1980s. The BAB built a one-story masonry addition to the west for rolle bolle courts. This article, by Diane Oestreich, is slightly modified from the original that appeared in the Rock Island Argus and Moline Dispatch on September 7, 2003.